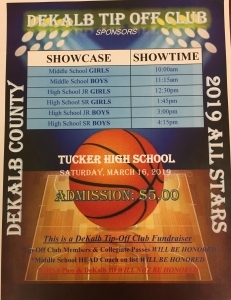 Some of the best middle school and high school basketball players in DeKalb County are set to show off their talents during the six-game All-Star Showcase hosted by the DeKalb County Tip-off Club on Saturday at Tucker High School. The event features six games (3 girls, 3 boys) beginning with the DCSD Middle School Girls’ All-Stars at 10:00 am to kick off the event. The Middle School Boys’ All-Stars will take the court at 11:15 am for their chance to shine. The second session features the girls playing in the Junior All-Star Showcase and the Unsigned Senior Showcase. The Juniors are set for a 12:30 pm tip. The game will feature some of the top DCSD junior girls’ players including Martin Luther King Jr.’s Ashlynn Green and Stephenson’s Kassidy Broussard and Sierra Wynn as part of the home team coached by King’s Vincent Gatling who took the Lady Lions to the state playoffs in his first year at the helm. Cedar Grove head coach Shenetria Wyche leads the visitors in the Juniors game led by Arabia Mountain’s Ke’Andrea Middlebrooks and Columbia’s Daija Carr who helped lead the Lady Eagles to a Final Four appearance. Wyche led her Lady Saints to the playoffs after losing three top players from a year ago. The Unsigned Senior Girls’ All-Stars follow at 1:45 pm with Final Four Coach Eric Bell of Columbia heading up the home team. Bell has a pair of 1,000 career point players in his own Shontrice Austin and Arabia Mountain’s Kennedi Manning leading his group. The visiting team is being coached by Rosaria Rice of Druid Hills who led the Lady Red Devils to the state playoffs for the first time since 1993. Rice has a 1,000 point career player of his own with Chamblee’s Trinity Edwards along with Lakeside’s do everything senior Kiara Jackson among his roster. Class 5A All-State selections and Final Four participants Eric Gaines of Lithonia and KD Johnson of Southwest DeKalb (over 1,000 points as a junior) lead the Juniors home team coached by Stone Mountain’s Tony Stroud (300 career wins) in the 3:00 pm game at Tucker. Arabia Mountain’s Norman Brown heads up the visiting Juniors team with a roster consisting of Columbia’s Devin Longstreet, Lakeside’s Grant Prusik, Martin Luther King Jr.’s D’vonja Frett and Class 6A runner-up Tucker’s Jermontae Hill. The Unsigned Senior Boys’ Showcase rounds out the day of basketball with a 4:15 pm scheduled start at Tucker. Final Four coach Wallace Corker of Lithonia has a home team roster including Dunwoody’s Richard Jones, Lakeside’s Dante Cannon-Ford, Lithonia’s Bryson Rockcliffe and high scoring Bryson Dennis from Stone Mountain. Another Final Four coach heads up the visiting Seniors team in Southwest DeKalb’s Eugene Brown who picked up his 200th career win this season. He has versatile guards Rodney Smith of Chamblee and Redan’s Siah Gray to work with Southwest DeKalb’s James Glisson III and Druid Hill’s Matt Guthrie among others. Admission to the event is $5 with all proceeds going to the DeKalb County Tip-off Club.